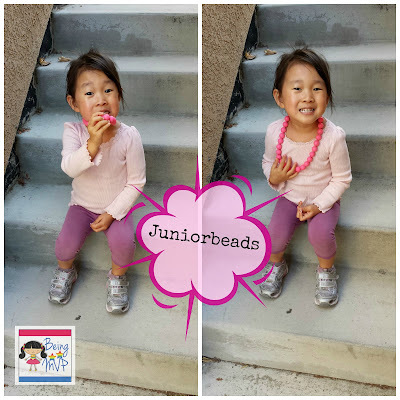 I am a fan of Chewbeads so when I found out that they introduced a line called Juniorbeads for little fashionistas in the making, I was ecstatic to receive a few pieces for Kenzie to review. Juniorbeads are made from 100% silicone and free of phthalates, lead and BPA. Ever since Kenzie's friends have been wearing "jewelry", she has been pining for mine. However, since I am obnoxiously worried that she would 1) break/ruin my jewelry and 2) choke herself, Kenzie has remained accessory free 98% of the time. When the Juniorbeads necklaces and bracelets arrived, she immediately wanted to know if they were hers since they curiously looked like the necklaces Mason has been chewing on. I exclaimed yes and even told her that some even glowed in the dark! That equated in her mind as having "nighttime" jewelry that must be worn to bed. She immediately wanted to wear the punchy pink Jane Jr. necklace to school and so off she went. It features a breakaway clasp which I love for safety. It can also easily be washed with dish soap by hand or in the dishwasher. This is a fantastic feature because although Kenzie is 3.5 years old, things still end up in her mouth - especially when she sees Mason doing the same. The length (10 inches) is perfect on her and she can wear it for a long time. She can easily slip it over her head without my help. The Madison Jr. glow in the dark necklace was a hit and let's just say that she was up for awhile in the dark staring at her necklace. It also features the breakaway clasp which is perfect for young children. The style is a bit different in that it features knotted ribbon which holds the beads in place. Although Kenzie loves her new bangles, they are still a wee bit larger for her and even though she hikes them on her bicep, she prefers to give them to Mason to chew on. Buy It: You can purchase the Jane Jr. necklace for $19.50, Madison Jr. necklace for $18.50 and Skinny Charles Jr. Bangles for $6 each. 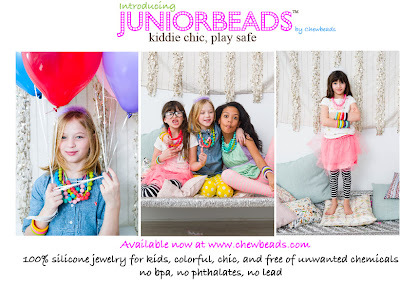 Make sure to connect with Juniorbeads on Facebook and Twitter! I just love them. I totally understand your concerns, I would have the same ones for sure. She looks so adorable and so very happy with her necklaces! They are a little too much for my budget right now, but I would love to have them for my great-niece! Perhaps for the holidays. How cute too bad I don't have any little girls in my life. Totally adorable! love this line of jewelry for the little ladies. Thanks for sharing. So cute! Your daughter is so fashionable and stylish! It looks like my comment didn't post. :( I just said this is such a cute idea and it makes me wish I had a daughter! :) I love all of the cool ideas people have been coming up with lately! Adorable! I love the idea of jewelry that is safe, easy to clean, and cute! 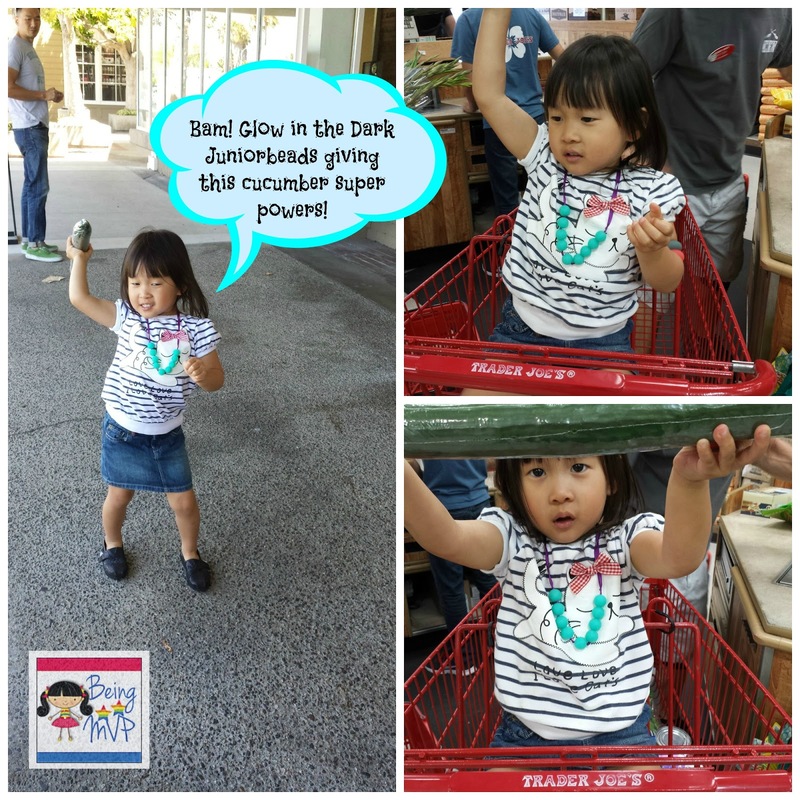 Now the littlest ladies don't need to feel left out. I just love the colors of the beads. Great Idea! those are so cute. would love that for my daughter! I love Chewbeads. Functional and stylish plus I love that it can go in the dishwasher! at a time. The initial consultation will give you a good opportunity to clear all doubts that you may have.